How Do I Configure SellerZen with QuickBooks Simple Start or QuickBooks Essentials? We highly recommend that you subscribe to QuickBooks Online's PLUS account since it gives you the best features. The most important feature is inventory tracking, which allows you to run detailed reports on your inventory items. If you choose to use the Simple Start or Essentials, plan, then you won't be able to track your inventory quantity. You'll have to map your Amazon inventory to Non-inventory items. Click here for creating a Non-inventory item and mapping it on SellerZen. 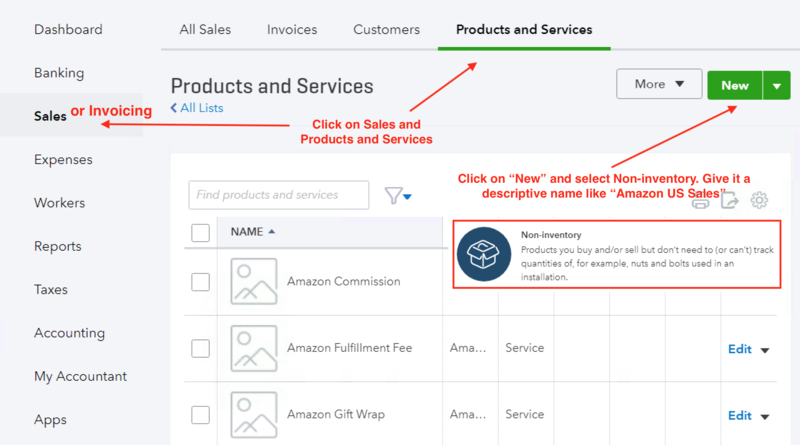 To add a Non-Inventory Item, go to Sales (may be called Invoicing) > Products and Services, Add New. Give it a descriptive name so that you'll know what the item is when you run reports. For instance, you may want to name it after the marketplace, like "Amazon US Sales." Or if you have a category of similar items, you can call it "Amazon US Kitchenware." Once you've created the item, type name in the field that appears when you click "Use the following item for all (Marketplace) SKUs on the SKU Mapping tab.